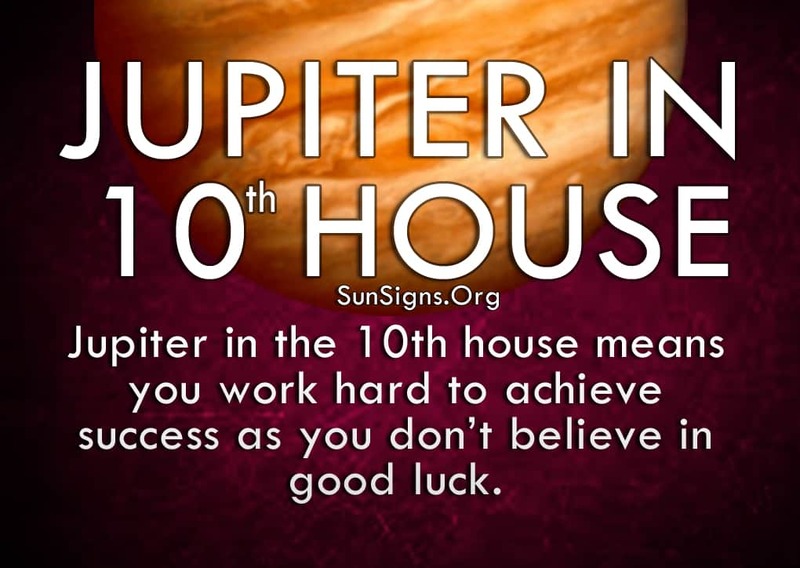 While some people view you as lucky, Jupiter in the 10th house means you work hard to achieve all of your success. You don’t believe in random luck. Everything you have is because you earned it. And you have the status symbols around your home and office to prove it. When you see something you want you go after it, and let nothing stand in your way. No matter how difficult or seemingly impossible something is, you go for it like there’s no tomorrow. Your ability to see into the future and create what you want for it makes you very reliable and resourceful. You are the rock that others build off of for they know they can count on you to come through for them every time. The Jupiter in tenth house astrology shows you know how to excel and are able to bring others with you to do the same. If you allow yourself more fun and relaxation within your social circle, you will find greater spiritual growth and fulfillment through these relationships. (Know Your Spiritual Sign). This strategy also works well in your personal life, so be sure not to dismiss your friends or loved ones when they come to you with an idea on how to do something. While they appreciate your feedback, you tend to throw out whatever they wanted to do and insert your own plan. Be patient and listen to them, and they will love you even more for it. (This is the personality trait for the ruling zodiac sign for this house, Capricorn). But the one thing people with Jupiter in 10th house have to be careful of is overstepping your bounds. Sometimes you barrel ahead, so sure of yourself and your plan that you don’t stop to ask anyone else if they have a different idea. When you’re working by yourself this is fine. But if you’re working as part of a team they might resent your attitude. You can be overbearing at times, especially when you are so focused on the objective at hand. Stop to make sure you aren’t stepping on anyone’s toes while you work your way to the top. That can turn your good luck into misfortune if you’re not mindful of those around you. While most people appreciate your hard work and dedication, your colleagues might not be so ecstatic. Try to include them in your projects or brainstorming sessions, and they will get on board with your ideas faster. And once they see the kind of good fortune you enjoy, they will want some of that for themselves. Just make sure to include them in the decision-making process and you will find a team that is behind you every step of the way. (Get your free career horoscope). Although you are concerned with status, and have symbols of your wealth and success everywhere, they love you for your loyalty and responsible nature. You never let them down and they admire your honesty and integrity. There’s plenty of time for work and career advancement during the week. Save your free time on the weekends for hanging out and recreational activities. It will keep you from getting burnt out, and you can use your incredible stamina to get everything you want out of life.